A 19 amino acid synthetic peptide within the carboxy terminal domain of rat Aquaporin 1 that is 100% homologous in mouse, rat, human and Bovine. This domain is predicted to be cytoplasmic. Our Abpromise guarantee covers the use of ab15080 in the following tested applications. WB 1/1000 - 1/5000. Predicted molecular weight: 32 kDa.Can be blocked with Aquaporin 1 peptide (ab25381). 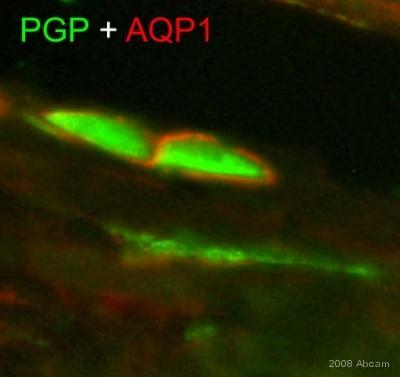 ab15080 staining Aquaporin 1 in human kidney tubule tissue sections by IHC-P (formaldehyde-fixed paraffin-embedded sections). Tissue samples were fixed with formaldehyde. Antigen retrieval was by heat mediation in citrate buffer (20 minutes at 100°C). Samples were incubated with primary antibody 1/2000(background reducer diluent) for 20 minutes at 25°C. An undiluted HRP polymer Goat anti mouse/rabbit monoclonal IgG was used as secondary antibody. ab15080 staining Aquaporin 1 in the intervertebral disc (nucleus pulposus) of the cow cell line by ICC/IF (Immunocytochemistry/immunofluorescence). Cells were fixed with paraformaldehyde, permeabilized with 0.5% Triton X-100 and blocked with 10% serum for 30 minutes at 21°C. Samples were incubated with primary antibody (1/200) for 24 hours at 4°C. 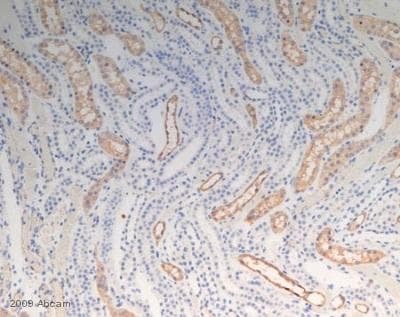 An Alexa Fluor® 488-conjugated Goat anti-rabbit IgG polyclonal was used as the secondary antibody (1/200). 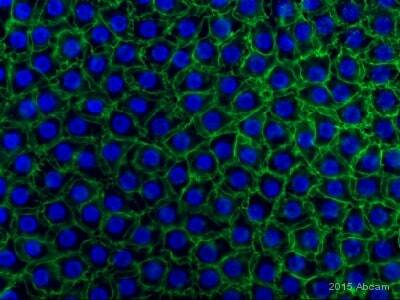 ab15080 staining Aquaporin1 in porcine jejunum by immunohistochemistry (Frozen sections). Tissue underwent fixation in paraformaldehyde without undergoing permeabilization and blocking steps. The primary antibody diluted 1/500 and incubated with sample for 24 hours. A Texas Red® conjugated goat polyclonal IgG whole molecule to rabbit, diluted 1/400 was used as the secondary. Immunocytochemistry - Anti-Aquaporin 1 antibody (ab15080)Image from Abreu-Rodríguez I et al., PLoS One. 2011;6(12):e28385. Epub 2011 Dec 7. 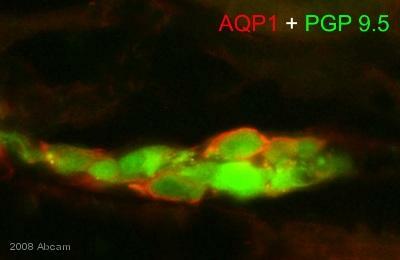 Fig 1.; doi:10.1371/journal.pone.0028385; December 7, 2011, PLoS ONE 6(12): e28385. 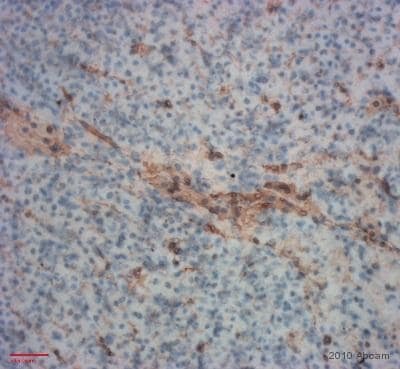 ab15080 staining Aquaporin 1 in rat 9L (gliosarcoma) cells by Immunocytochemistry. Cells were kept under normoxic conditions (upper panel) or exposed to hypoxia (lower panel). Cells were then fixed with paraformaldehyde, permeabilized in 0.1% Triton X-100 in PBS, before being blocked with 10% fetal calf serum + 1 mg/ml BSA in PBS overnight at 4°C. Samples were subsequently incubated with primary antibody (1/500 in diluent) and a peroxidase-conjugated goat anti-rabbit IgG was used as a secondary antibody. Samples were stained using DAB and counter-stained with hematoxylin. ab15080 at 1/500 dilution, staining Aquaporin 1 in sheep duodenum section by immunohistochemistry (Frozen sections). Sections were paraformaldehyde fixed and incubated with ab15080, for 24 hours. 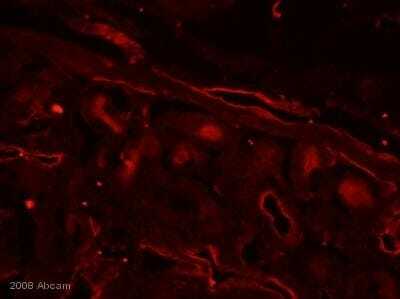 A Texas Red® conjugated goat polyclonal to rabbit Ig, diluted 1/400 was used as the secondary antibody.